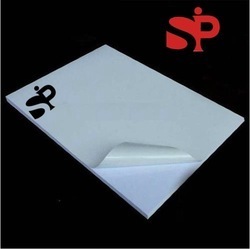 Pioneers in the industry, we offer sticker paper from India. With the assistance of skilled and experienced professionals, we are engaged in manufacturing and supplying a superior range of Sticker Paper and Gumming sheet that is quality-tested by professional auditors before dispatch. Acknowledged for their attractive looks, highly adhesive nature and durable printing, these offered products are widely accredited and acknowledged in the global market. They are eco-friendly and are widely used in printing, advertising and communicating.